Since I started using Mother Goose Time last May, I have received in our set up pack these little signs to put up and set up Activity Areas. I always skipped over them thinking I just don't have that many corners. Maybe if I was a true daycare set up I could use these. Not to mention, in the past, almost all of our lessons were done at our big counter in the kitchen/dining room area. So what would I do, tape all the signs to the top of the counter. But recently, Mother Goose Time has been focusing on these Activity Areas. If MGT is focusing on it, then it is important for a reason. So I decided to give it a try. I cut up all the signs and started one by one placing them around the house. I was surprised to quickly find a place for each. But not in the traditional sense. Honestly, I think that's okay. Let me give you a quick tour of our Activity Areas. My house is small and crowded, so if I can do this, you can to. 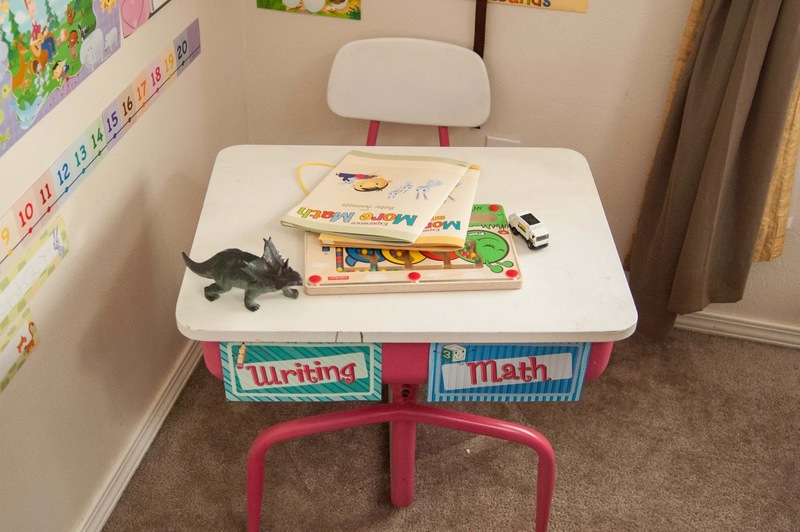 Ah yes, our pink desk in an all boy family. Garage sale find, in need of new paint. But none the less, we finally found a nice little corner for it out in the living room where school happens. I often have the More Math & More Reading workbooks sitting out. 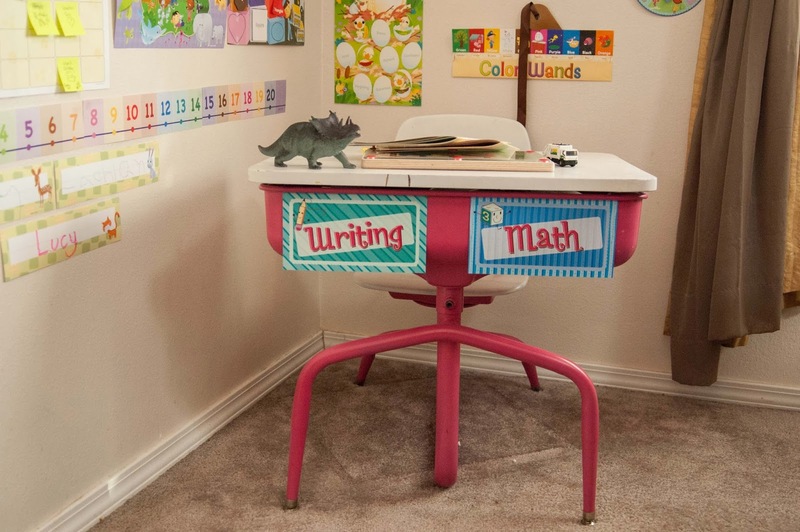 So I dubbed this area the Math and Writing area. 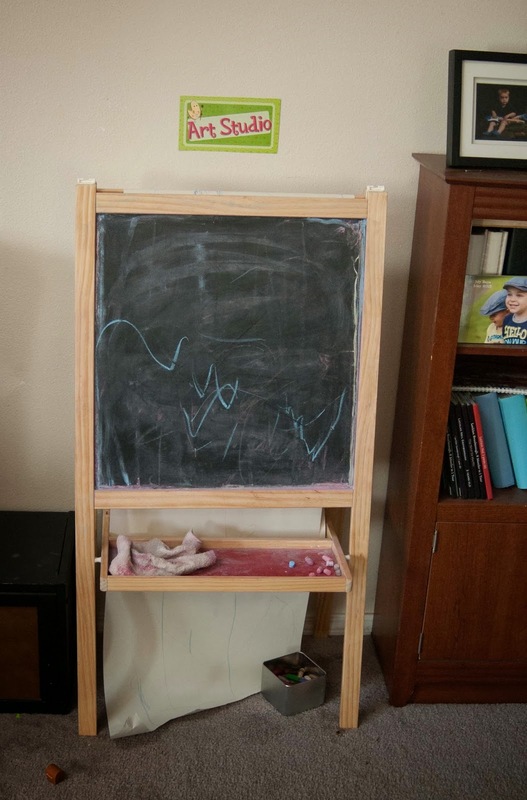 My amazing brother and sister in law got us this IKEA easel for Christmas. Now that the ginormous Christmas tree is gone, this is where it has found it's home. So here, is the Art Studio. They actually stop and draw here a lot. But a lot of our arts and crafts happens while sitting on the floor or at the counter. Still, this is a good place to designate. This is my highly organized library area. Can you say, purging needed? The books out front are from our local library. I don't like to tuck them into the shelf because then they get lost amongst the chaos and don't get read. This way, they catch their eye and they get read. But, it's not pretty. Every time I try to get rid of books, I can only pick like 5, and it doesn't make a big impact. Anyone else have this problem? The chair to the right is my "command center". It is my beautiful rocker the crew girls got for me when I was pregnant with Peter. I can sit there and see most of the house as well as control the TV or music with all the remotes. This is going to be used a lot coming up here soon when baby #3 arrives. 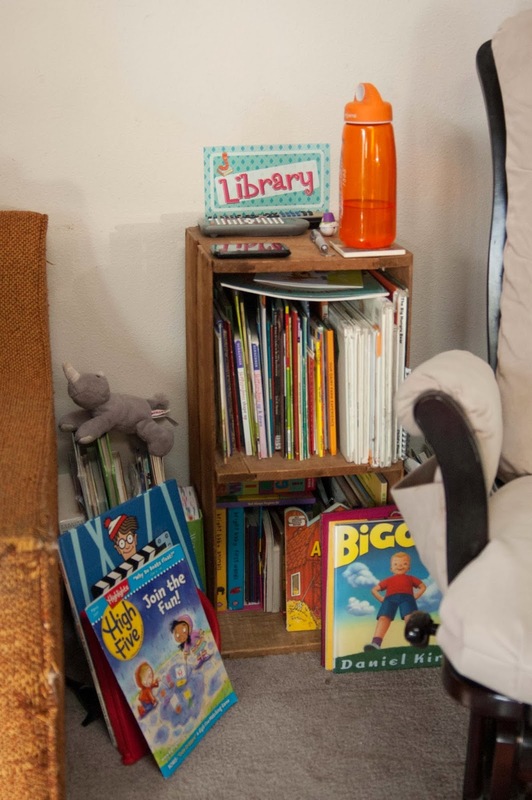 The boys will sometimes grab a book and hop up in Dad's ugly chair (orange thing to the left) to flip through it. Perfect little "area" we have here. I dubbed this little tool box the "Science Area". It's our new Magiscope we got at Christmas as well as petri dishes for collecting specimens. Lachlan likes to take this outside, collect things and take a peak under the microscope. Quiet Area = bed, right? 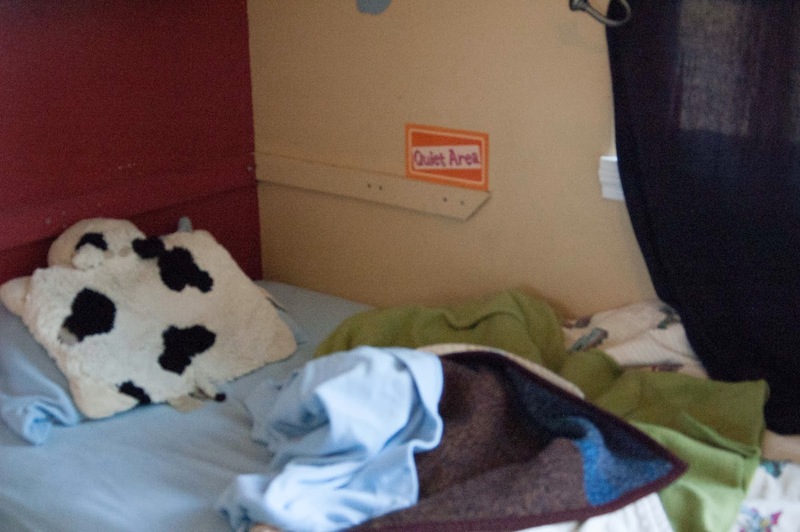 Here is my sons unmade bed which I posted the Quiet Area sign over. This is where he has quiet time, but more or less his quiet time is this room as a whole. If he needs some down time, by himself, this is where he goes. Now check out that music area. It's about 6 inches wide, covered in guinea pig bedding and hay. It's a crack between two pieces of furniture with our guitar and drum set squeezed in. The boys get them out all the time and take turns making music. 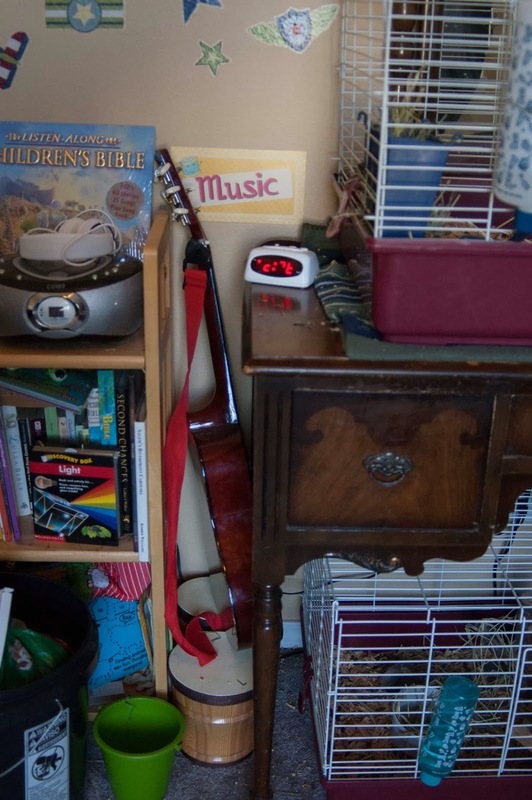 I have other instruments around the house, but not all of them accessible all the time, because well, I might go crazy. But early on, I wanted actual instruments, not just a collection of plastic things that look like instruments that just make noise. So I am quite happy with my 6 inch Music Area. Here is a look, behind the closet doors. Don't scream, although I often do. 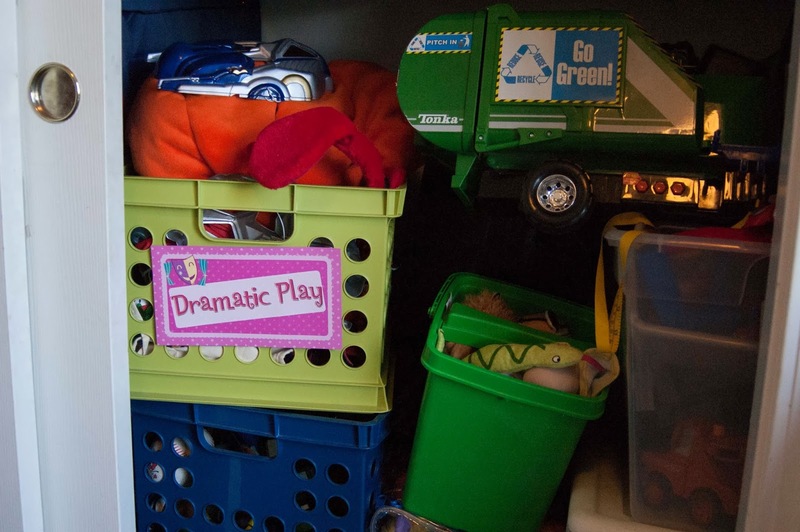 That bin that I have labeled with the Dramatic Play sign is our dress up bin. It has masks we have collected at birthday parties and all their old Halloween costumes. Right next to it is our puppet bucket. Both, great for Dramatic Play. 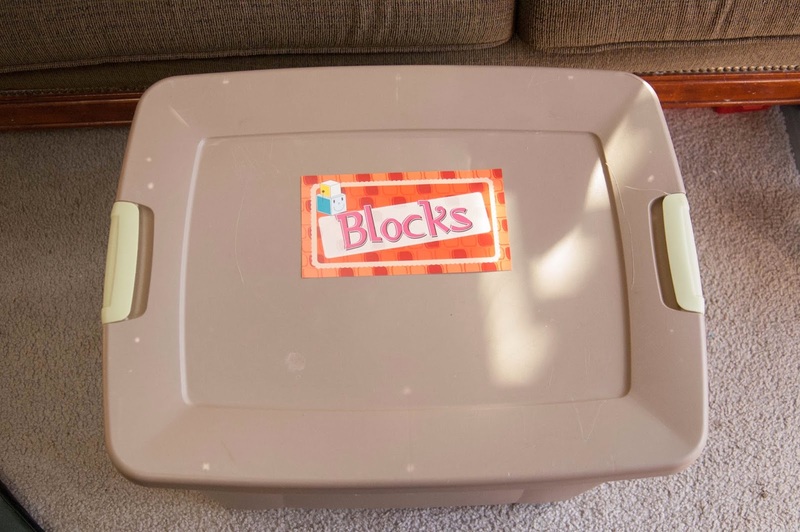 Lastly, I labeled our box of Lego Duplos with the Blocks sign. We don't have the traditional plain wooden blocks, but I think this is close enough. We received this big bin as a gift from a co-worker of Jeff's. 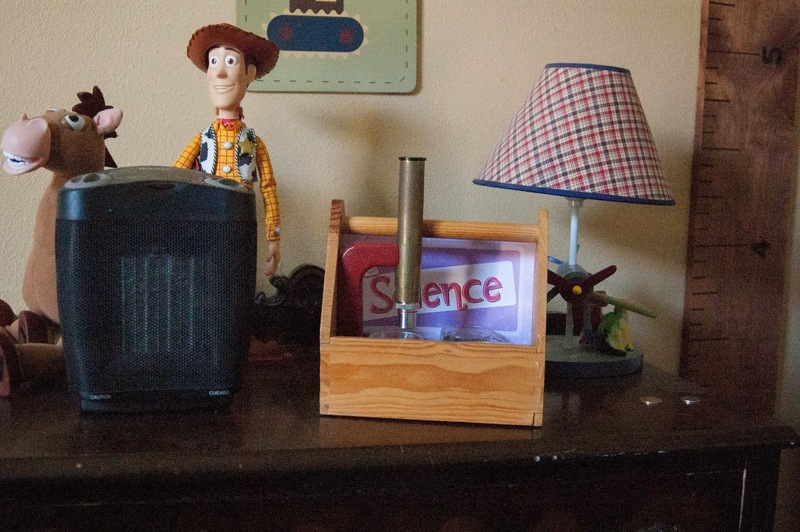 Her sons are grown, but they still had this bin stored away. They kindly thought of us, and it has been a BIG hit. Lachlan noticed the labels right away and asked me what I was doing. I told him I was setting up school areas. He moved on to playing and didn't seem to care much at the moment. I do look forward to him noticing more and more of the signs as he goes about his day. I will keep you all posted on how this goes. But for now, I can say, I sort of had a sigh of relief when I was all done. "I do have all the areas of a traditional school, phew." They may not look the same as a school room, but I have all the bases covered. Yay for me! Give it a try, your areas might all be different storage bins or 6 inch cracks, but I bet they are there.